Show/Hide Fonts. Toggle the OS Font dialog. Bold. Sets the selected text to Bold. Note that the selection's current font must have a Bold variant. Italic. Sets the selected text to Italic. Note that the selection's current font must have a Italic variant. Underline. Sets the selected text to Underline. Strike Through. Sets the selected text to Strikethrough. Bigger. Increases selected text size by 1 point (e.g. 14pt to 15 pt). Smaller. Decreases selected text size by 1 point (e.g. 14pt to 13 pt). Kern. Opens the Kern sub-menu. Ligature. 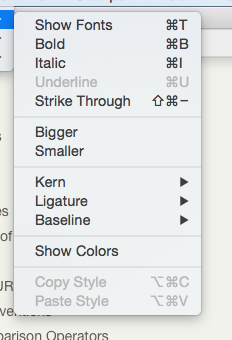 Opens the Ligature sub-menu. Baseline. Opens the Baseline sub-menu. Show/Hide Colors. Toggles the OS 'Colors' colour picker palette. Copy Style. Copies the text style of the current selection (including the paragraph ruler) to the clipboard. Paste Style. Reformats the selection (including the paragraph ruler) using the text style on the clipboard, if one is found.